I have a love/hate relationship with the roguelike genre and definitely have to be in the right state of mind to play one or else something might get broken. What does one do, however if the game they are about to play doesn’t necessarily state that it’s a roguelike but instead allows you to discover that little tidbit out for yourself? I found that out after playing bit Dungeon and I’m happy to report that nothing got broken outside of my hopes and a handful of crackers I was eating. bit Dungeon is a top-down dungeon crawler where you’re tasked with exploring a…well, dungeon in hopes of finding your lost wife. The two of you got kidnapped by a demon one thousand years earlier and put into some sort of deep sleep. You casually awake one thousand years later to find yourself in the bowels of a rather dingy place armed with a shield, a fancy blue cape, and the burning desire to be reunited with your wife. Fortunately for you, there’s a weapon in the room where you wake up, since fighting with only a shield might hinder your pace a bit. Once you have the sword, a key falls from the ceiling (demons really do struggle to keep security consistent) and you’re off on a grand adventure to save your lady friend. The game is laid out a bit like dungeons from the original The Legend of Zelda or The Binding of Isaac, so it should be pretty familiar to anyone that actually knows what video games are. 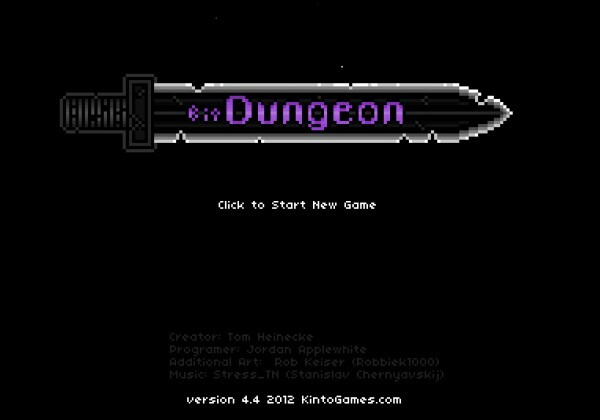 The big difference, however, is that bit Dungeon has a point and click control scheme. You click on enemies to attack, hold the mouse button to block and hold it longer to release a stun attack. The controls are the weakest part about this game, and I’d really be curious why the creators went in that direction as opposed to using the keyboard because I do think people will get soured on the touchy mouse clicking. Despite that, the game is actually pretty entertaining and takes the roguelike elements to a pretty intense level. All the rooms you explore are randomly generated, as are the enemies you’ll face and the loot (weapons, armor, potions, etc.) you find. My first run through had me facing pretty weak enemies in the first room where as the very next time I played there was a rather intimidating knight boss hanging around. Once you’ve beaten the enemies, a key drops from the ceiling like before and you’re able to pick which rooms you’ll take on next. The stage ends when you find that level’s boss and from there you continue on until I assume you find your wife. I’m not sure, I never made it that far. There’s also a simple stat system at play (which I completely missed at first glance) so that you can determine the sort of dungeon explorer you want to be. 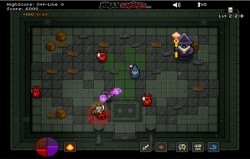 bit Dungeon has more positives than negatives, with a few that I think are worth noting. For instance, when you go back into a room you’ve already cleared you’ll sometimes find creatures nibbling on the bones of your enemies or their ghosts floating around. 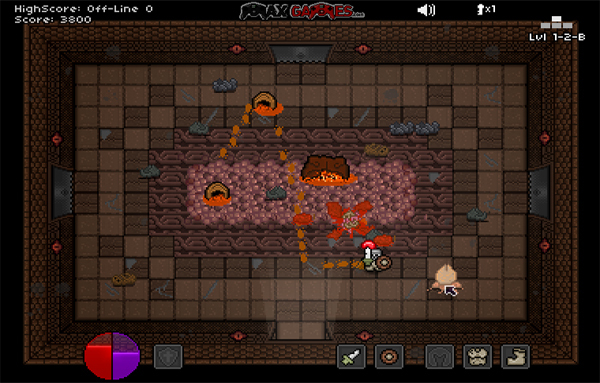 You also track the blood/slime of your enemies around the rooms as you walk. Those are two things that should be in every game. The graphics aren’t anything revolutionary, but they are retro pixels which is very comforting to my brain for some reason. You’re going to need to take off your shoes before you come in, buddy. There was definitely a lot of love for the genre flowing through the game, especially the further along you get. Being blindsided by the whole roguelike thing was a bit of a shock, but sometimes we need a jolt here and there. Otherwise, how will we know we’re still alive?